Every woman wants to look beautiful and irresistible. Of course, before some special event or an important event we recorded to the hairdresser, stylist or salon. But, unfortunately, it is not always possible to plan everything in advance. An unexpected invitation to a restaurant, company party, or just going to the movies should not put us at an impasse. There are many ways to make a hairstyle at home, while expending minimum resources and time. The only thing this requires is the desire and a modicum of imagination. For medium length hair there are many kinds of hair styling. Hair to style curls, waves, can be combed back, giving it Shine and smoothness with wax. You can just get the hair behind the ears and on the back or side secure with Bobby pins or hairpins. 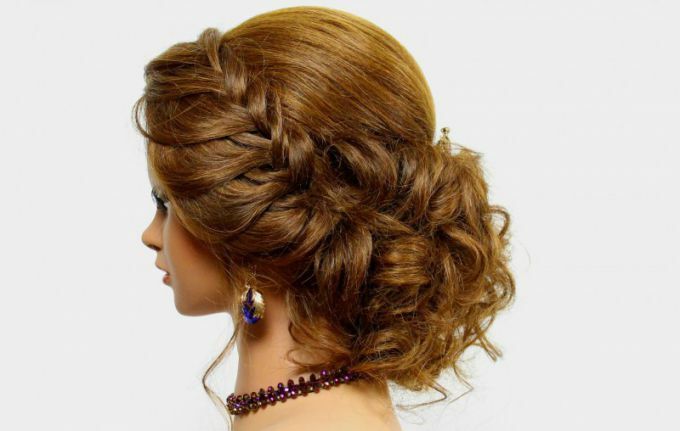 For special occasions you can use false hair, which will make the hair bigger and puffier. Most importantly, do not worry and feel free to experiment with your hair. As an example, offer you a stylish haircut "French." This hairstyle is perfect for medium length hair, thin and sparse. The effect of this hairstyle gives the weak the tension of the hair due to which it gets lift and volume. First of all, your hair needs to be clean. Wash them with using the conditioner and hair mask. Dry your hair with a Hairdryer. The front parting. It can be straight or zigzag. Choose a machine that fits you goes. Keep it strictly in the middle, starting from the top. On the one hand, gather hair elastic, and on the other hand we will divide them into three parts and, grabbing the additional strands from the face and from the parting, begin to braid a French braid. Then the tip of the spit secure with a clip or rubber band and begin to braid the same braid on the other side of the parting. Both braids then you need to cross at the neck and stab Bobby pins by tucking the hair ends under the braids. In order to do a braid in the hair is not very tight, you can use a flat comb to pull strands of hair down a bit and spread them like a fan. If hair was not braided too smoothly, you likewise can slightly straighten the hair. In the end, lightly spray the hair lacquer and flatten gently with your fingers interwoven with the lateral strands.